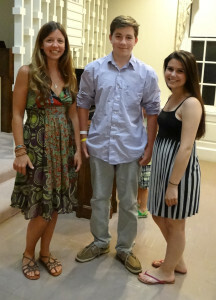 NAMI Fairfield celebrated all participants of its 1st annual Essay Contest about mental illness. The Essay Contest Celebration and Award Ceremony took place on Wednesday, June 5th 2013 in Fairfield. Awards were presented to the winning authors and gifts and certificates were presented to all participants. Photos of the evening can be seen on this page, and the essays can be read below. Official Citations from the Connecticut General Assembly, presented by Representatives Kim Fawcett, Tony Hwang and Brenda Kupchick and Senator John McKinney, were offered to the winners by The Honorable Daniel Caruso, Probate Court Judge in Fairfield. Fairfield Selectman Kevin Kiley gave a heartfelt introduction to the winner in the adult category, Kerri Gawreluk. The high school winner, Isabel Zayas was introduced by her school counselor, Pamela Scott. Both Kerri and Isabel read their moving and poignant essays. Middle School winner Joey Hopkins’ father read his essay as Joey was not feeling well. *Winner: How the Light Gets In… My Healing Journey through Mental Illness, by Kerri Gawreluk, Black Rock, CT. Read Kerri’s essay. Darkness to Light by Albert Hsu, Norwalk, CT. Read Albert’s essay. Mystifying by Jacob Presson, Norwalk, CT. Read Jacob’s essay. Through My Eyes by Sharon Stevenson, Bridgeport, CT. Read Sharon’s essay. Why My Heart Smiles! by Corrine Annebeth Taylor, Stamford, CT. Read Corrine’s essay. Depression is a Curse, by Michelle Bravo, Easton, CT. Read Michelle’s essay. My Quality of Life, by Anonymous, Norwalk, CT. Read this essay. * Winner: Crazy, by Isabel Zayas, Wilton HS, Wilton, CT. Read Isabel’s essay. The Flowers (A Fictional Short Story) by Meredith Morello, Wilton HS, Wilton, CT. Read Meredith’s essay. Through the Eyes of a Mood Disorder by Anonymous, Fairfield Ludlowe HS, Fairfield, CT. Read this essay. The Battle Between Mental Illness vs. Society by Santia Rene, Stamford HS, Stamford, CT. Read Santia’s essay. * Winner: Joey Hopkins, St. Ann’s School, Black Rock, Connecticut. Read Joey’s essay. Removing the Thorn, by Anonymous, Fairfield Woods Middle School, Fairfield, CT. Read this essay. B Stigma-Free applauds all of its courageous authors in the 2013 Essay Contest. We thank you for your willingness to let your voice be heard!